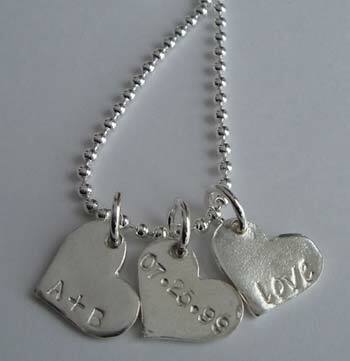 Alli's Originals specializes in made to order, hand stamped, personalized sterling silver jewellery. The Princess Charming Collection is all about outwardly celebrating those special relationships ... your children, your grandchildren, your husband, your wife, your boyfriend, your teacher, your friendships, or even your family pet. It's about "wearing your heart on your sleeve". Both English and Hebrew alphabet and numbers are available. For Hebrew lettering or symbols, please specify in your order. For some of the products, the Bradley hand font is also available, if interested in this option, please enquire with Alli. Please note that extra charms can be ordered and added to any of the pieces shown. To order, please see a la carte menu. Additional order specifications or requirements can be entered through the PayPal website during the payment process. 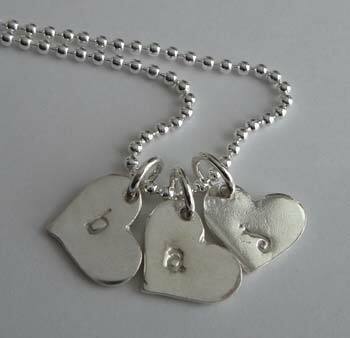 Alli's Originals specializes in personalized, hand-made sterling silver jewellery. Alli uses only the finest quality materials, including: Swarovski crystals, semi precious stones, and sterling silver. The overall feel of Alli's Originals is feminine, delicate, elegant, fresh, bright, and cheerful. Below are some of the products we offer. (Click on any photo to enlarge). These sweet little discs measure 8mm and can be stamped with an initial, number, heart, flower or star. Includes a 16" sparkly ball chain necklace. Longer chains available. To add more discs to your necklace please see the A La Carte section. *** For men we suggest 20"
3 sterling silver round discs, 9mm in diameter. Each disc is hand-stamped with an initial or up to 9 small letters or one symbol of your choice. 6 letters can fit horizontally on the discs, any more than 6 will be stamped along the bottom perimeter of the disc. Perfect for a name or phrase; eg, baby, love, hope, dream, etc. These discs include a 16" sterling silver regular or ball chain necklace. These discs are hand cast giving them a distressed look. The surface texture varies giving these discs a very “Hand Made” quality. To add extra discs to these necklaces please see the A La Carte section. new! LARGE DARLING DISC NECKLACE new! This is our NEW LARGE DISC and is 1.5 mm smaller than our old Large Disc. A single 12.5 mm disc dangles from a 16" ball chain or link chain necklace. Additional discs are available in the A La Carte section. This disc fits up to 8 upper case block letters or 10 lower case letters and/or a date (stamped numeric over 2 lines) or a symbol of choice. new! EXTRA LARGE DISC NECKLACE new! This necklace includes one Extra Large Disc (19mm) on a 16" ball or link chain necklace. This disc fits up to 2 lines of text with a maximum of 11 upper case or 13 lower case letters or a date per line. Dates are stamped numeric. Please indicate if you would like us to add a little heart stamp at the bottom of your disc. Longer chain lengths are available below. These are our NEW Darling Hearts. These hearts are larger than our old Darling Hearts Necklace. This necklace includes 3 Hearts on a 16" ball or link chain. Additional hearts are available in the A La Carte section. new! 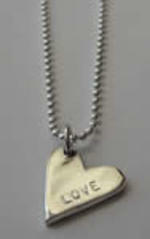 Triple Love Necklace new! These beautiful hearts measure 10mm and includes a 16" sparkly ball chain necklace or link chain (longer chain lengths available). 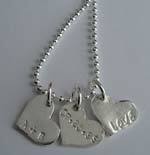 Each heart can be stamped with an initial, a number or up to 5 lower case letters or 4 upper case letters. To order additional tags or crystal add on's please see A La Carte section. new! ADAM'S TAGS NECKLACE new! This necklace includes 2 of our NEW rectangle tags on a 16" ball chain or link chain. These tags measure 18mm x 7.5mm. VERTICAL ~ these tags can fit up to 9 upper case block letters or 11 lower case comic font letters or a date (stamped numeric) over 2 lines. Additional tags are available in the A La Carte section. This Square tag measures 12mm x 12mm and includes a 16" ball or link chain. The tag can fit up to 3 lines with a maximum of 7 characters per line. A symbol counts as 2 lines. Dots in between dates count as a letter. Dates will be stamped over 2 lines for this piece. A 16" chain is included. Each additional square is $28. Please see A La Carte for additional large square tags. new! GABI'S SQUARE TAG NECKLACE new! This Extra Large Square Tag is NEW! This tag measures 15.5mm and includes a 16" ball chain or link chain necklace. This Square tag can fit up to 3 lines of text with a maximum of 9 upper case block or 11 lower case comic letters, an initial or a date (stamped numeric) ~ For Hebrew text please inquire. new! ISABEL'S HEART NECKLACE new! This necklace includes a Tiffany Style heart that dangles from a 16" ball or link chain. This heart measures 19mm x 22mm (3/4") and can fit up to 2 lines of text. Line 1 fits up to 10 upper case block or 12 lower case comic letters. Line 2 fits up to 8 upper case or 10 lower case comic letters or a date (stamped numeric). new! BEN'S BAR NECKLACE new! 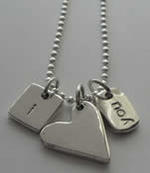 This necklace includes ONE Bar tag on a 16" ball chain or link chain. The bar measures 6mm wide and 20mm long and is 2mm thick. Due to the fact that it is one of our thicker bars, we are able to offer customizing on both sides. Each side can fit up to 9 upper case block letters, 11 lower case comic letters or a date (stamped numeric). Additional bars are available in the A La Carte section. new! BRAD'S TAGS NECKLACE new! 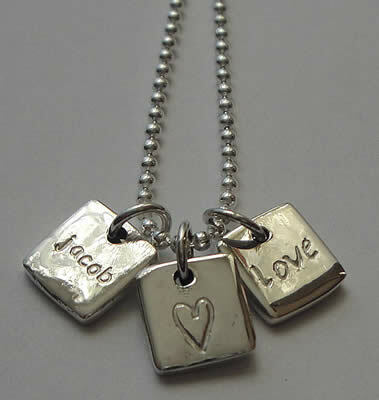 This necklace includes both of our newer tags, the Adam's Tag (7.5mm x 18mm) and Ben's Bar (6mm x 20mm). These tags dangle from a 16" ball chain or link chain. Additional tags are available in the A La Carte section. Customizing for the Rectangle Tag: VERTICAL ~ these tags can fit up to 9 upper case block letters or 11 lower case comic font letters or a date (stamped numeric) over 2 lines. Customizing for Ben's Bar: Due to the fact that it is one of our thicker bars, we are able to offer customizing on both sides. Each side can fit up to 9 upper case block letters, 11 lower case comic letters or a date (stamped numeric). new! NAT'S DOG TAG NECKLACE new! 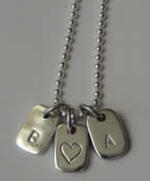 This necklace includes one Nat's Dog Tag on the 16" ball chain or link chain. This tag measures 18mm long x 12mm wide. VERTICAL ~ this tag can fit up to 3 lines of text with up to 10 upper case or 12 lower case letters or a date (stamped numeric) per line. HORIZONTAL~This tag can fit up to 4 lines of text with up to 7 upper case or 8 lower case letters per line. Additional tags are available below. Please fill in your customizing options here. You can order an additional tag below for $33. This necklace is made from .925 sterling silver. 3 darling charms dangle from a 16” regular link or ball chain necklace. The peace sign measures 10mm, the heart measures 11mm and the cupcake measures 11mm x 15mm. To add more charms to your necklace please see the A La Carte section. • This sweet necklace makes a perfect teacher's gift! • This delicious apple is made from .925 sterling silver and measures 7mm x 9mm. • The heart measures 9mm. • The charms dangle from a 16" link or ball chain necklace. • For additional charms please see A La Carte section. This beautiful necklace includes a Hamsa Charm and a sweet puffed heart. The Hamsa measures 18mm x 8mm and the heart measures 13mm x 11mm. The charms dangle from a 16" regular link or ball chain necklace. This Necklace is made from .925 sterling silver and includes a 16" regular link or ball chain necklace. The Hamsa is very dainty and measures 8mm x 13mm. To add more charms to your necklace please see A La Carte section. This Sweet necklace is an exclusive Alli's Originals and is made from .925 sterling silver. The charms dangle from a 16" link or ball chain necklace. This yummy cupcake was hand formed using a special fine silver clay. This process gives the charm a beautiful "handmade" quality leaving it with natural creases and a varied surface texture. The cupcake measures 11mm x 15mm and carries a nice weight. The Darling disc measures 8mm and can fit a symbol, up to 9 upper case letters or 7 lower case letters or an initial. If more than 6 upper case letters are requested, they will be stamped along the bottom perimeter of the disc. To add more charms, please see the A La Carte section. This sweet necklace makes a perfect teacher's gift! This delicious apple is made from .925 sterling silver and measures 7mm x 9mm. The apple can be stamped with an initial or left blank. For additional charms please see A La Carte section. This necklace is made from .925 sterling silver and includes a sweet apple charm (7mm x9mm), a small disc (8mm) and a sparkly diamond shaped, red Swarovski crystal. The charms dangle from a 16" sterling silver regular link chain or ball chain necklace. To add more charms please see the A La Carte section. Additional Darling Squares are available in the A La Carte section. These square tags are made from .925 sterling silver and measure 10 mm x 10 mm and 2mm thick. These are much thicker than most of our tags. These tags can fit up to 5 upper case letters or 7 lower case Comic, 5 Bradley Hand Font an initial or a symbol. 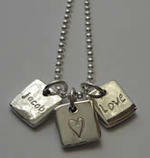 The tags dangle from a 16" link or ball chain necklace. 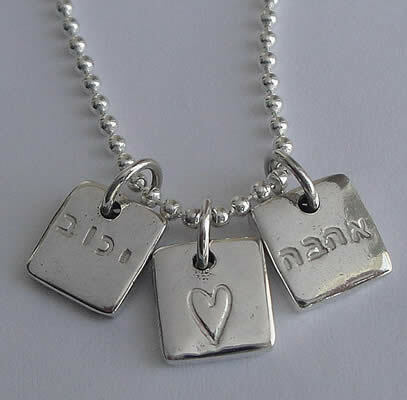 For the Hebrew option, please see "Hebrew Jewelry" page. These mini dog tags are made from .925 sterling silver and measure 8mm x 12mm and 2mm thick. These are much thicker than most of our tags. These tags can fit up to 5 upper case letters or 7 lower case, an initial or a symbol. If you would like stamping on both sides then it has to be with TEXT ONLY (no symbols). (Note: 2 sides, maximum 5 Upper Case 7 Lower Case letters or an initial. Stamping is available on both sides Text Only. This sweet heart is made from .925 sterling silver and measures 16mm and 2mm thick. The heart can fit up to 9 lower or upper case letters, 7 Block font, up to 7 Bradley Hand font letters, 7 Hebrew letters or a date. Stamping is available on both sides of this heart. This beautiful necklace is made from .925 sterling silver and includes a "Sweetheart" a Darling Square and Darling Dog Tag. 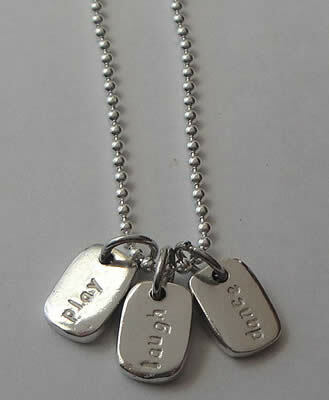 These tags dangle from a 16" link or ball chain necklace. The Heart measures 16mm, the square measures 10mm and the rectangle measures 8mm x 11mm. The heart can fit up to 9 lower or upper case letters, up to 7 Bradley hand font letters or a date Stamping is available on both sides of this heart. The Square can fit up to 5 upper case letters, 7 lower case letters, 4 of the bradley hand font, an initial or symbol. The Darling Dog Tag can fit up to 5 Upper Case, 7 Lower Case Letters, 3 Bradley Hand font letters , an initial or a symbol. If you would like stamping on both sides of these tags then symbols are not available, it has to be with TEXT ONLY (no symbols). 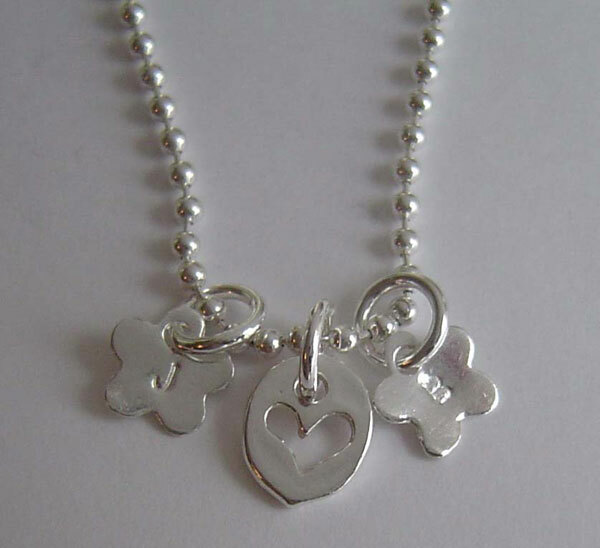 This beautiful charm necklace is made from .925 sterling silver and includes 3 hearts on a 16" ball or link chain. The hearts measure 11mm. These hearts have been hand cast giving them a distressed look. The surface texture varies giving these hearts a very "Hand Made" quality. Each heart can fit up to 6 upper case letters or 8 lower case comic letters, a date (stamped numeric) or an initial. Please choose the customizing you would like for each heart. This necklace is made from .925 sterling silver and includes 3 Medium sized Daisies that dangle from a 16" link or ball chain necklace. The daisies measure 11mm and can fit an initial or symbol or up to 5 upper case or 7 lower case letters. These daisies are hand cast giving them a distressed look. The surface texture varies giving these Daisies a very “Hand Made” quality. We are also able to use our new smaller Hebrew font for these. Extra charms are available for this necklace, please see the A La Carte Section. This necklace includes 2 little daisy tags and an open heart little oval tag. The daisies can each be stamped with one upper case initial or a tiny heart or star symbol. The daisies measure 7mm and the open heart tag measures 7mm x 9mm. The charms dangle from a 16" link or ball chain necklace. Additional charms can be found in the A La Carte section. 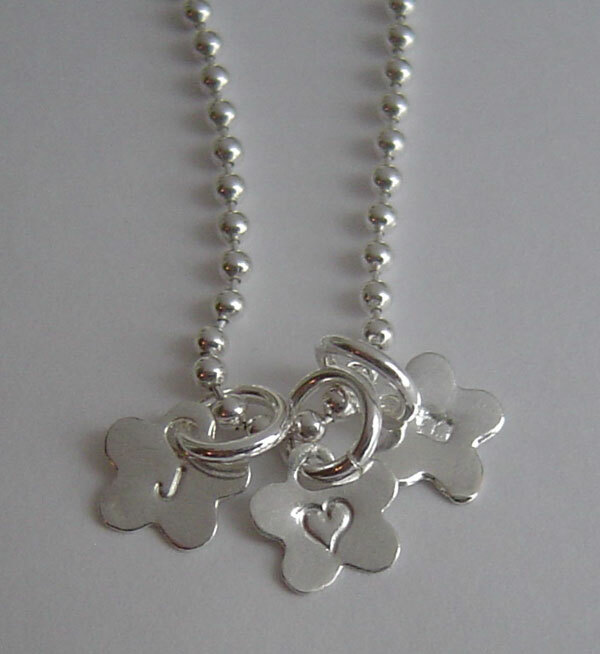 This necklace includes 3 little daisy tags that hang from a 16" link or ball chain necklace. The daisies measure 7mm and can be stamped with one upper case initial or a tiny heart or star. Additional daisies may be purchased in the A La Carte section.